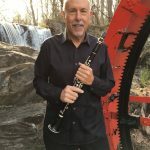 Steve Loew, clarinet, is a former member of the U.S. Marine Band and a member of the White House Orchestra who has performed for President’s Ford, Carter, Reagan, and Bush Senior. A graduate of the Juilliard School of Music, Mr. Loew has also played with the New York Philarmonic, the National Symphony Orchestra, and has collaborated with such artists as Marvin Hamlisch, Doc Severinsen, Roberta Flack, Meatloaf, Barbara Cook, and Johnny Mathis. Mr. Loew was born in Brooklyn, NY and now lives in Asheville, NC.